Is it time to migrate your SharePoint again? With SharePoint 2013 out, Service Pack 1 at our doors and the popularity of Office 365 these days, we are bound to see more and more SharePoint Migrations. I am not sure if it’s a good thing or a bad one yet, but I have participated in some ways to many SharePoint Migrations both as a consultant as well as through our work here with Sharegate. To prepare yourself for a SharePoint Migration, here are 5 effective tips that have never let me down. This is mandatory in any SharePoint Migration. 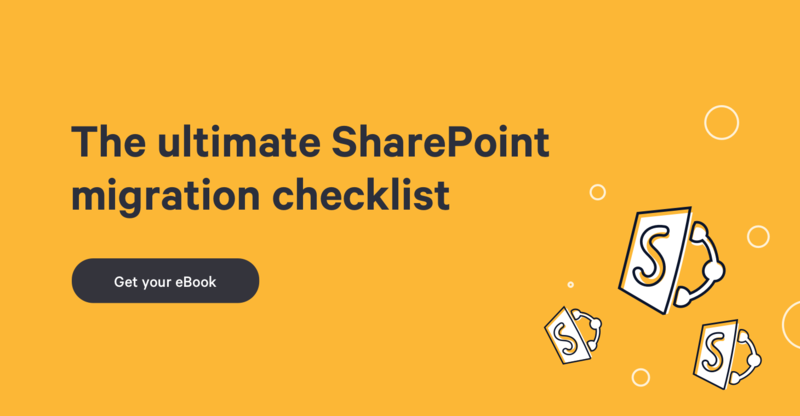 In fact, it’s a good idea to always keep an active inventory of what you have to maintain and uphold your SharePoint Governance rules. The reason we need an inventory to prepare ourselves for a successful SharePoint Migration is simple. We’ll need to identify them as well as what actions we might want to run on each of them. This brings me to our next tips, which involve checking for running workflows, but most importantly my RMR Strategy. Your inventory should include as much information as possible without adding useless information either. Information like « Does it contain custom Master Pages, Page Layouts, etc » are useful to know because it will affect our migration process. Wondering how exactly you build this inventory yourself without buying or installing stuff on your servers? I recently wrote an article with the help of Adam Preston called « Build an inventory before a SharePoint Migration and put it in Visio ». The beauty of this is that you can use either Visio or Excel to store your inventory, it’ll be a lot easier to classify and prepare your environment for migration once you know what you have. Tricky one this one, see our objective when doing a SharePoint Migration is for it to be as seamless as possible to the users but to keep everything as is if we can. The problem is that the state of a running workflow cannot be kept without doing some crazy stuff or editing directly in the database, which would make you fall in an unsupported scenario with Microsoft. Workflows created lose the reference to their workflow definition after the migration if they were in progress. Because when they try to complete the task, they look for the old definition and cannot find it. What we generally do is look for all Workflows that are still running or « In Progress » if you will, and complete or cancel them. Once this is done, we can successfully migrate. Again this brings me back to the Inventory in our first tip. You need to know what you have in terms of sites and what they contain, so a list of all your sites that contain a workflow for example. This will help you better prioritize and plan. Then, it’s a matter of running a PowerShell to find and in most cases Terminate the running Workflows. 3. New Features in SharePoint - Time for a new architecture? Let’s face it, if you’re planning to migrate to a new version of SharePoint, it’s generally to take advantage of the new features it brings to the table. A while back I talked about some of the new features in SharePoint 2013 that make it worth the switch, but sometimes it’s a lot simpler than that. Sometimes we need to re-organize our information architecture or how we classify our content . What we can do is map what no longer exists and what we plan to do for each of them. For example, though it will work through Database-Attach upgrade, the Blank Site and Meeting Site templates are no longer available to create in SharePoint 2013. Also, you might want to create Content Types to use where you didn’t before or turn a choice column into a Managed Metadata column using the Term Store. What I do is pull the complete inventory we’ve built and assign an action for each in the summary view. Whether it is to Remove, Migrate or Rebuild the site in question, I will be able to know exactly what to do when I look at the plan. On another note, I tend to assign « points » to each of these sites in my inventory when I assign one of these three tasks. This helps me when building the roadmap to know how much I can do each month, based on the points system. Nothing is worst than to come to your work routine and seeing everything is changed. Whether you like it or not, you are the bad guy for changing this comfortable routine everyone had. They knew where to click and how to do their job. Now, things are going to look different and in many cases work differently as well. This is even more of a factor when migrating from File Shares to SharePoint. Without a proper and well built communication plan, your new SharePoint’s adoption could quickly flatline. Communication is crucial and can be so simple to build, they key is constant communication of changes, but most importantly, the value this will add to their every day task. In almost all cases, an educated user will be willing to overlook quirks in your application if they are aware of the overall value this will bring. Knowing when this will impact their job and having access to training adds great value and greatly helps you increase adoption. In some of my previous work, we’ve gone as far as to provide custom video training to provide a very targeted and custom, on-demand training. This is been extremely well received, every time. Obviously, I work here at Sharegate and it may sound bias, but using tools can greatly help with a SharePoint Migration. As I mentioned, you can do most of the work, building an inventory with PowerShell and stopping running workflows without any expensive tool installed on your servers. But sometimes, it’s worth taking a look when comparing the price and amount of work it would save by using tools like Sharegate to migrate and manipulate content or entire SharePoint Sites.